It's starting to look a lot like Christmas, don't you agree? I gotta tell ya, I'm so super excited making most of my home Christmas decor by myself. I'm all about rustic this year so there is a lot of twine, burlap, plaid, and even yarn LOL. OH I forgot, and A LOT of glitter too! It's not Christmas if there is no glitter everywhere, right? Today I'm excited to show you all my Rustic Burlap Christmas Wreath that I made using a lot of burlap ribbon and a pool noodle. Yup, you hear that right! I used a POOL NOODLE! 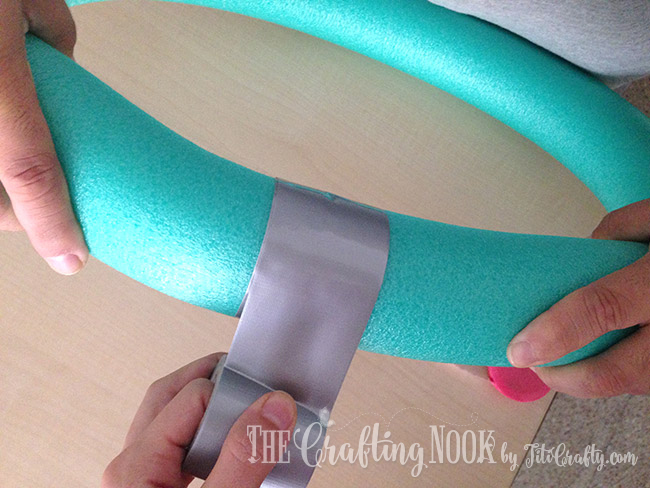 I found this site in which Carrie shows how to make a pool noodle wreath. She explains it all with such detail, I knew right away I could make this! I can find pool noodles here anytime of the year and it was so cheap. I saved over $10 by not buying it online and buying that pool noodle that cost me around $1,50. The best part? I can just take off Christmas decor and cover it with Spring, Valentine, Easter, summer... You name it! 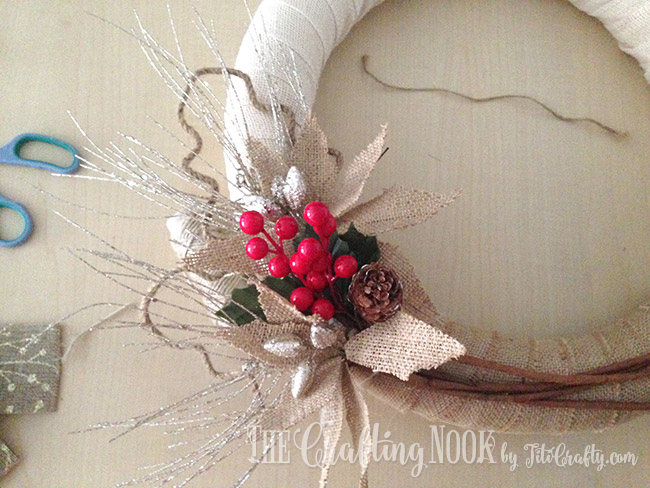 For this Wreath I didn't use any pin or anything that would pinch the foam form. I used twine to secure everything and it turned out so pretty. I must confess, I might be the only crazy lady in this condo with a wreath on the door LOL. But I so LOVE it! Who knows, maybe I inspire people to start doing it! 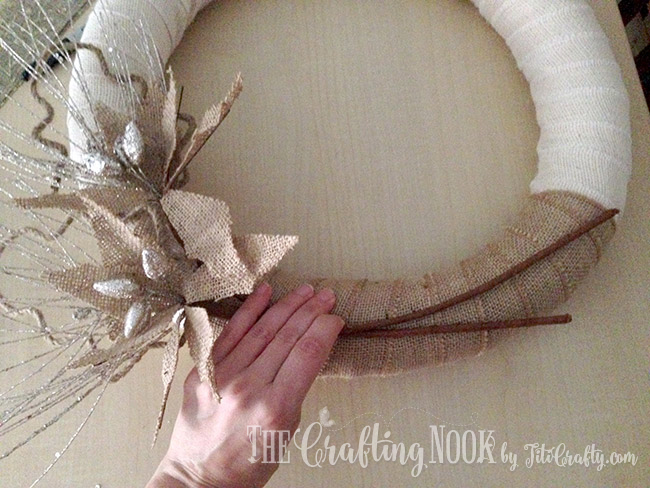 So, ok Let's see how I made my Rustic Burlap Christmas Wreath, shall we? -Any decoration you love to hang inside. 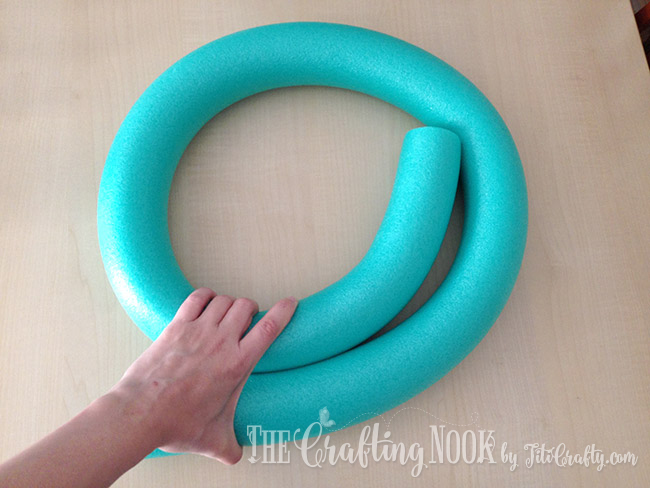 Since the pool noodle is used to being straight, you need to train it to go in a circle. To do this, you just need to bend it. I had a little one help you you just how easy it is. Just bend it one way and another, being careful not to make creases or kinks. You might need an extra pair of hands for this though! 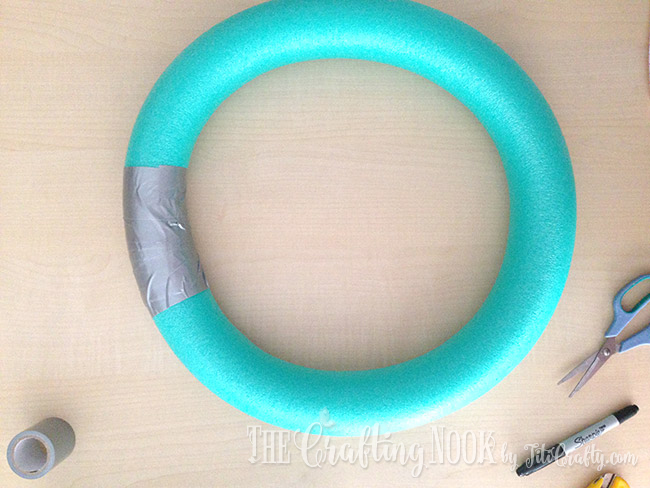 I decided to give it time so I created kind of a spiral and place it inside a box where it fit and left it for a couple days.Once the pool noodle is retrained, you are ready to put it all together. 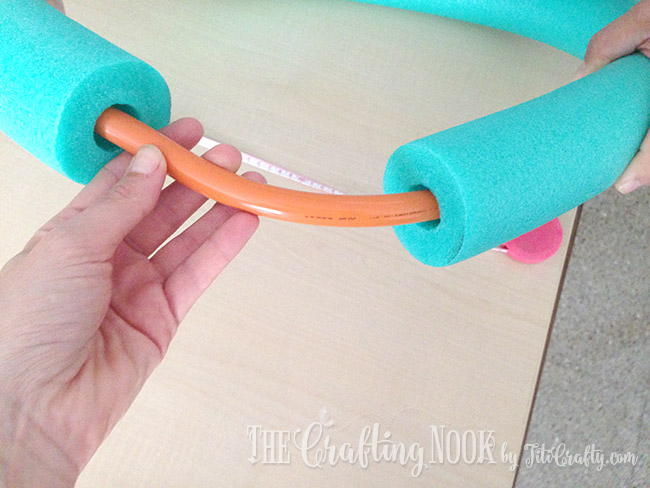 Insert the hose piece into the pool noodle on both ends and make both pool noodle ends meet. Work it bit so it gets as circular as possible. The you go! 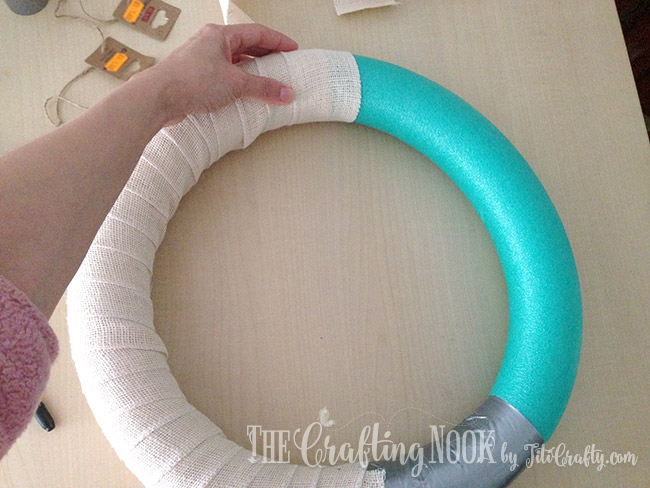 Now you have your inexpensive wreath foam form. 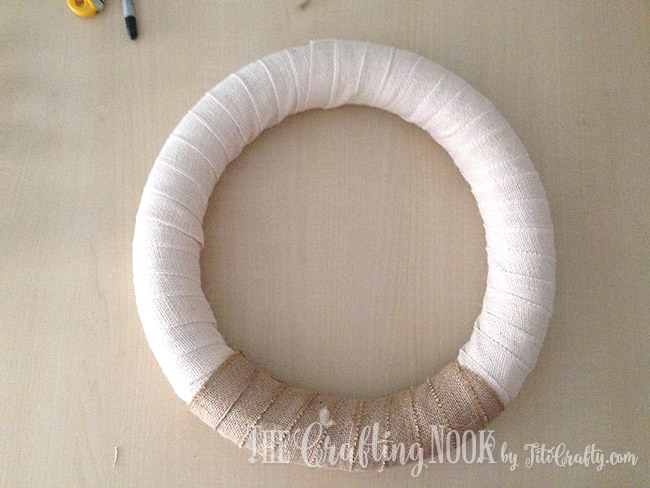 Now let's decorate it to make it your Rustic Burlap Christmas Wreath! 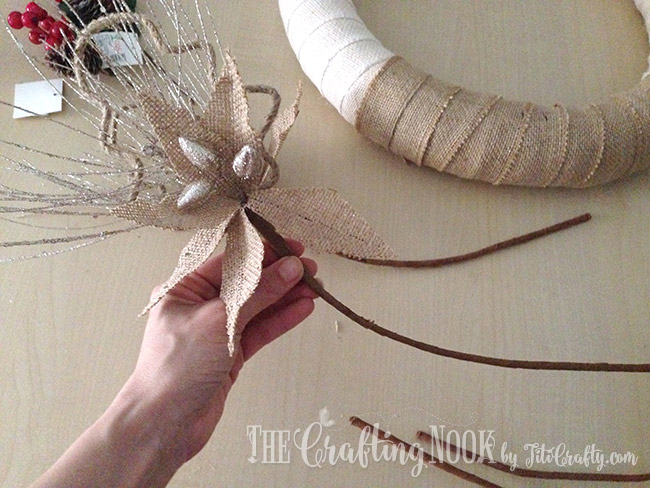 Using your light beige burlap ribbon start warping your foam form. I overlapped every half of the ribbon so the pool noodle color wouldn't show up and also wrapped from one end of duct tape to the other. Finish it up wrapping over the duct tape with your natural burlap ribbon. I did it like this because most of the decoration I used was darker, specially the bow. 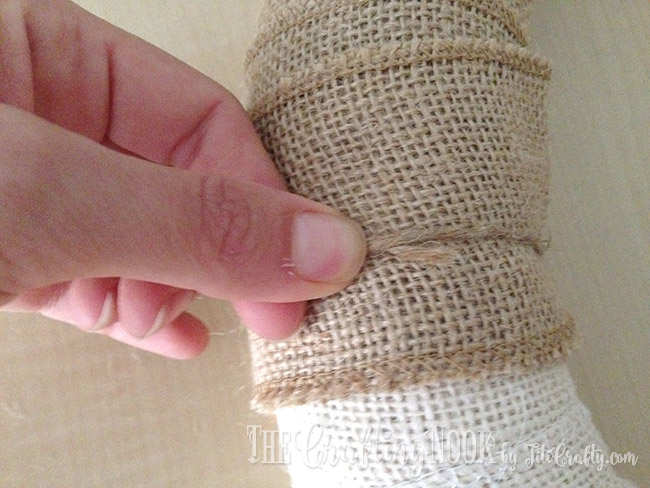 Use twine strips to secure the ends of your burlap ribbon by making a couple loops and making a tight knot. Or you can use pins if you prefer. Our foam form is covered! Then take your decorated burlap sprays and bend them so they get a round shape like your foam form. 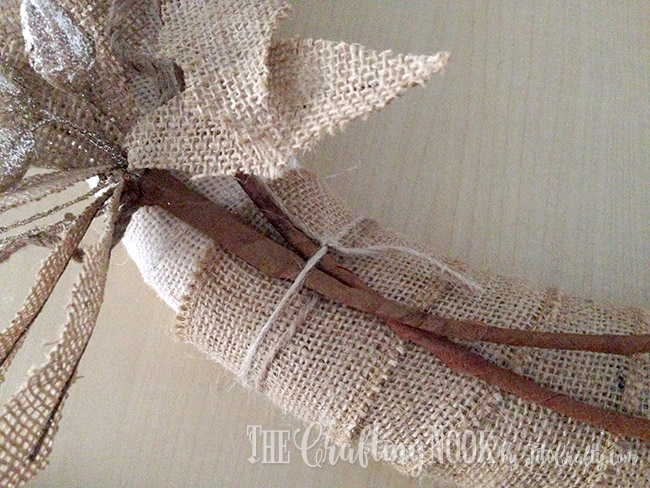 Place 2 of them on each side of your natural burlap ribbon space. Play with the composition as you thing is best for you. Secure them with a strip of twine. Adjust positions as needed. Insert your pinecone spray decor between both branches and make sure it fits into the twine too. Repeat the process on the other side and place your burlap bow in the middle. Also tie it up with a twine strip. Time to you your plaid ribbon...Now, take the decor you chose to hang inside and place it where you want it to be, secure it with a twine strip in place. 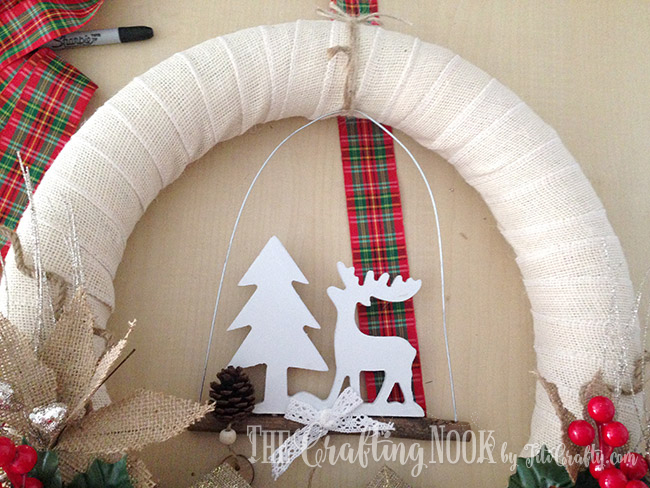 Finally run your plaid ribbon through the wreath and over your hanging decor hanger. Join the ends at the top and tie them into a bow. 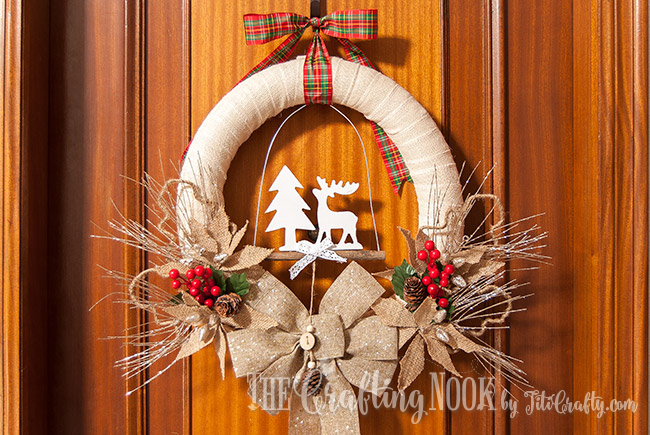 I did the bow with the wreath already on the door to tie it well to the wreath hanger.Your Rustic Burlap Christmas Wreath is now ready to be hung. It is perfect for a front door like mine, mantel, or even in your office space. 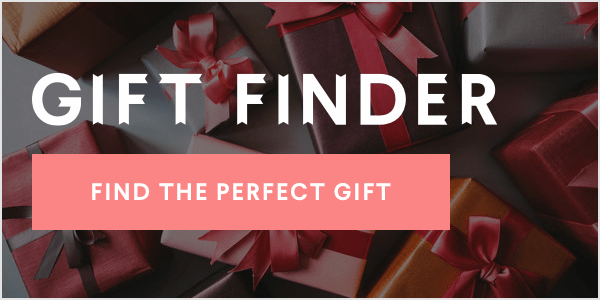 Give it a try and see how fun, frugal, and so quick it can be to get this crafty decor. 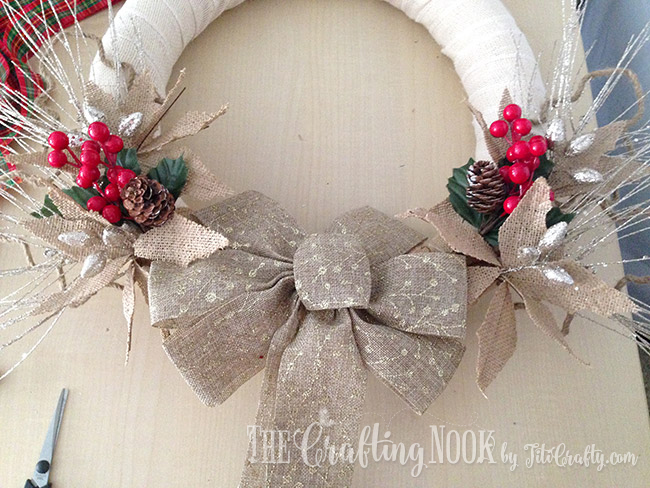 The post Rustic burlap Christmas wreath appeared first on The Crafting Nook by Titicrafty.